Initiated by President Kennedy as a counter for growing Cuban influence in Central and South America, the Alliance for Progress was to help integrate the economies of North and Latin America. Emphases for the program included land reform, democratic reform and tax reform. By the late 60’s the United States had become fully embroiled in Vietnam and South Asia, thus aid for Latin America waned. Furthermore, few Latin American countries proved willing to undertake the required reforms. 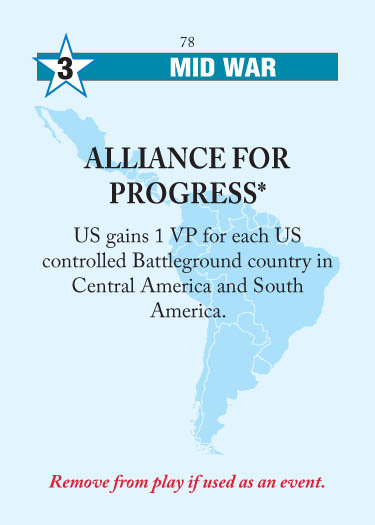 As a result, the Organization of American States disbanded its “permanent” Alliance for Progress Committee in 1973. A lot like the US OPEC, with two very crucial differences: 1) Alliance for Progress is not recurring; 2) Alliance for Progress often starts off scoring very low, but almost always scores quite high by the end of the game. It is therefore almost always an autoplay if I draw it early in the Mid War and the US doesn’t have many battlegrounds. But if they already control more than 2, I’ll just send it to space and hope that I draw it again later and can space it again. (Remember that like all discards, it is better discarded on Turn 7 than Turn 6.) If unable to space it, you can just use the Ops to break control of at least one of the US battlegrounds first. The reverse of the USSR analysis holds: if this can’t score you 3 or more VPs, play it for Ops and trigger it in the Late War for more. Once it gets to 3+ VPs, I tend to prepare to trigger it lest the USSR draw it in the Late War. This entry was posted in Mid War, US Events and tagged alliance for progress. Bookmark the permalink.